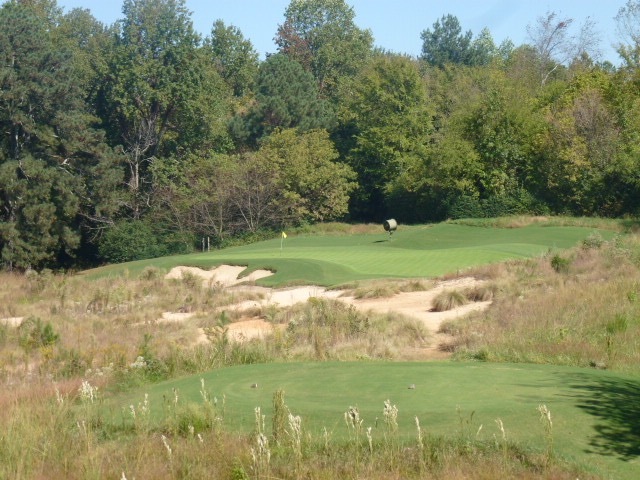 The par-3 6th, falling away left and right off a central crest, blends into the natural environment. Debates regarding the best golf in cities like Los Angeles, San Francisco, Chicago and Philadelphia typically revolve around tier 2 and 3 courses, as general consensus exists about the clubs there that are truly elite. Once past Peachtree Golf Club, widely considered no. 1 by knowledgable players and panels (including me), the conversation about what’s good in Atlanta quickly devolves into a “next best” middling tier 2-type argument (when it comes to what’s actually great, I would argue all of Atlanta’s golf qualifies as tier 2, at best). In that discussion you’ll get arguments for East Lake, the Atlanta Athletic Club, Atlanta Country Club, and maybe a push for Settindown Creek, or Capital City’s Crabapple Course, or possibly Hawks Ridge. Less lobbied is The Standard Club, a 2004 Mike Riley redesign atop Arthur Hills’ original course from 1987. And that makes no sense. The Standard Club sits at peer level to, if not above, the top golf in this city. Scenic, varied and challenging, Riley’s par-3’s at The Standard Club might be the area’s best. Here, the 190-yard 14th with a deep green angled across water. The Standard Club is located in Johns Creek, a few miles up the road from the Athletic Club. It’s surrounded by suburban development, a four-lane highway, commercial strips, office buildings — but you’d never know it. Like Augusta National, the club is insulated from the city’s encroachment by a dense buffer of woods and land, hiding a gorgeous course spread across nearly 300 acres of preserved nature. 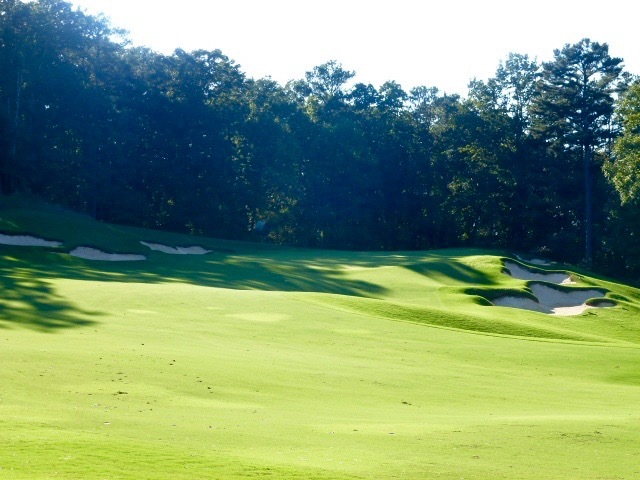 The first nine rolls through hardwoods over continuously moving terrain, and the second nine drops off a ridge to a galley of lower holes playing back and forth across Johns Creek. The short, downhill par-3 8th has another green that’s notched beautifully into the landscape. Hills hit Atlanta pay dirt starting the late 1980’s, building five courses in seven years including the 36-hole Golf Club of Georgia that helped cement his reputation as one of the premier architects of the moment. Though routed well, his design for The Standard Club was was unfortunately stuck in the golf tropes of the ’80’s, marked by narrow, oblong greens that were difficult to hit and small, round bunkers that neither fit the wide scale of the property nor accentuated its special qualities. Riley, who grew up caddying and reading the large and tumultuous greens at the A.W. 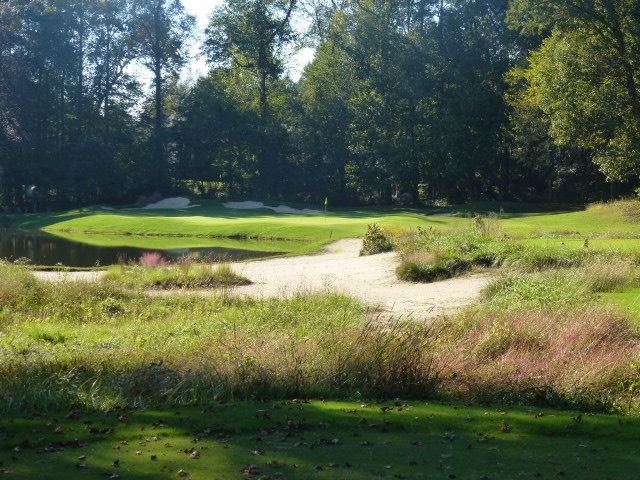 Tillinghast-designed Somerset Hills Country Club in New Jersey, had a different vision. Riley enlarged and rounded out the perimeters of the greens while adding more pronounced internal contour, and then crafted a new style of deep, choppy bunkers that are better suited to the movement and personality of the surroundings. The intricate putting surfaces at the 2nd, 5th, 6th, 13th, 14th and 18th deserve stand-alone notice. The big par-4 9th shows off The Standard Club’s rolling grounds. Riley actually cut down this ridge that extended left of the fairway bunker to alleviate the severity of the hole. The Standard Club round wastes no time getting to the thrills with a wide, downhill left-to-right opening par-4 that rewards a fearless opening poke. The 400-yard right-to-left 10th sweeps dangerously along a ravine, followed by a shot-maker’s run through the low holes along the creek. Seventeen is a 240-yard blast downhill to a green benched between a pond and a rock outcropping, and the par-5 18th rambles close to a drop off on the right before terminating at a deep green full of knobs and humps. There’s a lot of blueblood, inside/outside attitude that still exists in Atlanta, which might explain why the local tribes don’t hold The Standard Club in higher esteem. The setting and the diversity of architecture place The Standard Club firmly in any tier 1 discussion, but this former all-Jewish club (they now have an open membership) just doesn’t have the social sizzle of Capital City, Cherokee Town & CC or Piedmont Driving Club. But if you’re in the city to play golf and not to rub shoulders, make arrangements to play The Standard Club, asap (93). The deep, tumbling 18th green, one of the most detailed on the course, falls away steeply to the right.